The Oklahoma City Thunder returned to the winning column defeating the Cleveland Cavaliers 100-83 on Wednesday night in Chesapeake Energy Arena. 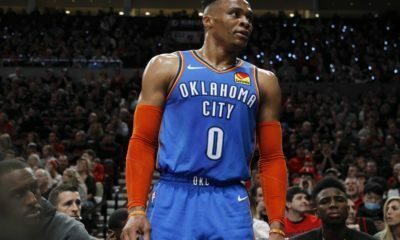 After a disappointing loss to the Denver Nuggets on Saturday night, the Thunder had three days off before tonight’s matchup with the Cavs, and Russell Westbrook’s late nights on the court paid off as he picked up his 107th career triple-double with 23 points, 19 rebounds (one shy of tying his career high), and 15 assists. Russ is now tied with Jason Kidd for 3rd overall career triple-doubles, and while it took Kidd 1,247 games to accomplish this, Westbrook does it in 760. Westbrook wasn’t the only Thunder player having success on offense tonight – Jerami Grant, who has been exceptional since his addition to the starting lineup, ended the night with 21 points and 4 blocks. Paul George comes in behind him with 18 points of his own, and the Thunder defense held the Cavs to under 20 points in the second half, which is the fifth time the Thunder have done so this season. The first half of play saw a lagging offense on both sides, Steven Adams having trouble getting his shots to fall, and the Cavs taking an 11-point lead early in the second quarter, but the Thunder came out of the locker room after halftime with a new found motivation to close out this game with a win, and a lot of good defense, as well as players knowing their roles and taking smart shots helped the Thunder secure its 13th win of the regular season. Russell Westbrook is the leader of this team, but he has more help this season than he has had in awhile. It seems like the past two or three seasons have put a strain on Westbrook with him feeling the need to carry this team on his back and take matters into his own hands. With so much talent in the Thunder’s starting lineup, as well as coming off the bench, different players are having big nights rather than just one or two every night. Jerami Grant has improved immensely from last season with new-found confidence, Dennis Schröder is an excellent point guard coming off the bench when Russ needs rest, and young guys such as Hamidou Diallo (when he’s healthy) and Deonte Burton are stepping up and playing with valiance and poise. The Thunder’s offense is going to be an ongoing battle this season, but the talent is there. In the first half of tonight’s game, nothing would fall right, shots were short and weak, and bad 3’s were made from players like Alex Abrines and Dennis Schröder. 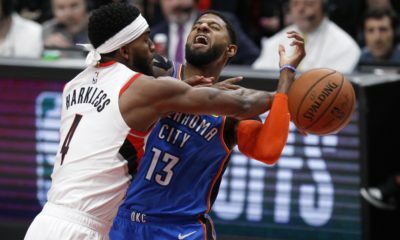 When this team finds their rhythm and falls into it, the shots get hot and crucial, and the Thunder have had plenty of spikes this season where good shots were being made leading to success. It’s no secret that the Thunder is not the best shooting team in the league, but they’ve been doing a great job so far making up for it by stepping up in other areas. There’s still a lot of basketball to be played, and it’s refreshing seeing multiple players contributing to these wins rather than one or two. Russell Westbrook has had long stretches in past seasons where it was solely up to him to bring the Thunder the wins they needed to have a chance in the postseason, but this year is so different with the talent and the drive on the team this season. 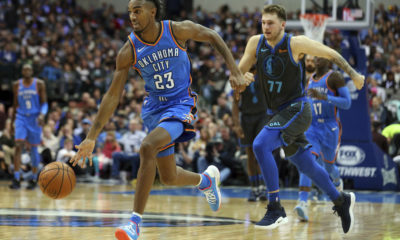 Players like Dennis, Steven, Jerami, and Deonte have improved tremendously and have meshed with this Thunder offense and rhythm Billy Donovan speaks about so much, and things are working in their favor. Sure, there will be some losses and there will be some bad losses, but the Thunder have shown fans they are ready to fight and play basketball as a unit rather than individually. The Thunder will be back in action in OKC as the Atlanta Hawks and Trae Young comes to town for the first regular season matchup. The Thunder improve to 13-7 in the season, 8-3 on their home court, and though the struggling Hawks come in with a 5-17 record, it will be interesting to see how this Thunder team will match up to young players like Trae Young when it comes down to it. 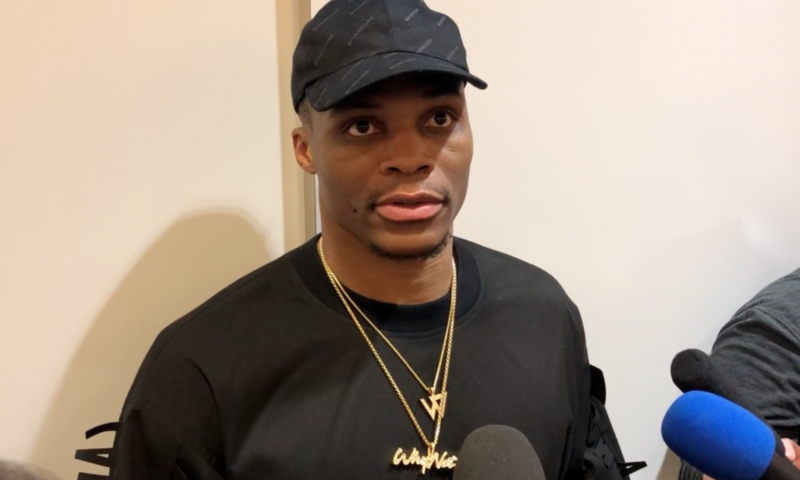 Watch below for the Thunder vs. Cavaliers postgame wrap-up and full postgame pressers from Russell Westbrook, Paul George, Jerami Grant, and Deonte Burton.